Word problems are challenging because children have to read and understand the problem, pick out pertinent information and select the correct operations. 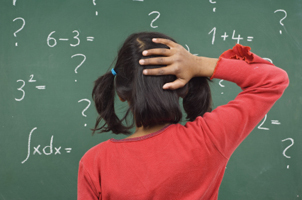 Fortunately, many sites have free math word problems that can help your child review before standardized tests, which often include this type of question. Here, you can find free printable PDF worksheets with word problems for students in first through eighth grade. Two worksheets (with solution sheets) are given for each grade level. The problems for first graders deal primarily with adding and subtracting, while those for seventh and eighth graders involve percents, fractions and decimals. The way the main word problems page is organized, you can view a thumbnail version of each worksheet before selecting it. This makes locating an appropriate level fairly simple. Addition, subtraction, multiplication and division are all covered in these free word problems. Your child can practice at home without the pressure of a timed exam or scored homework. The worksheets come in PDF format and each one comes with an answer key. One drawback is that answers are given but not explained. If your child needs help understanding why a certain answer was reached, you may need to help her. These free word problems come with explanations, which should be helpful for your son or daughter when learning to 'show work' on tests. Dozens of word problems include basic math, time, distance and velocity problems, as well as decimals with remainders. All problems are printable, and a timer is set up so your child can read the problem onscreen and write her answer while testing her speed. Four versions of each type of problem are offered, so there is plenty of variety to work with. Many numbers-only worksheets are also available in a range of math topics. Worksheets are not divided by grade or age level, but solely by topic (e.g., multiplication, percentages or subtracting fractions).